Our property is not affected by potential changes in the rental laws of South Lake Tahoe. This luxury property has over 2600 sq. ft. of living space and includes a huge, upper private deck and hot tub with views of the forest. 2 upper level master suites. Spacious and professionally decorated with three fireplaces! Kitchen has all the amenities: hardwood cabinets, granite counters, stainless-steel appliances, and large island. Pantry is stocked with most everything you need for meal preparation. A second, lower level family room area with fireplace and HD TV. A perfect place for the kids to hang out. Park off the street and out of the elements in the spacious, three-car garage. 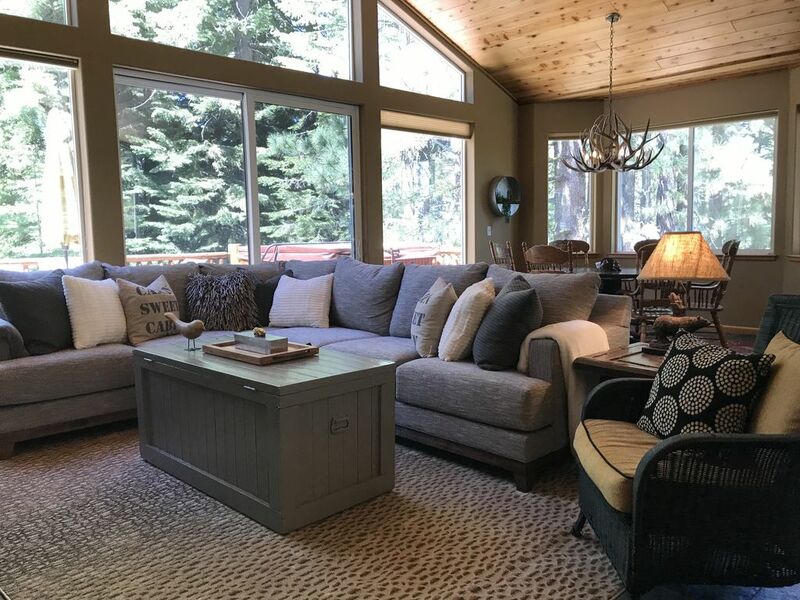 This beautifully decorated second home is located in a very quiet, secluded area in South Lake Tahoe just minutes from US 50 and Pioneer Trail. 4 miles to the Lake, 15 minutes to Heavenly Ski Resort and Casinos, close to Lake Tahoe Golf Course, 20 minutes to Sierra Tahoe Ski Resort, and 40 minutes to Kirkwood Ski Resort. Grocery store minutes away. This property is not convenient for those who cannot navigate stairs. We purchased this home as a getaway for the family. It is decorated and designed to enjoy the Tahoe lifestyle. Our home is in a quiet neighborhood surrounded by pines, walking and hiking trails. The tram at Heavenly is only 15 minutes away. The Lake Tahoe Golf Course is only a couple of minutes away. Grocery store and restaurants minutes away. Lake Tahoe golf course 5 minutes away. Main living area is a flight of stairs up from the entry. This needs to be considered for young children and the elderly. Amenities include, High Speed Wireless Internet Access -, Gas Grill and outdoor Dining on Upper Level Deck -, Private Hot Tub for 6 -, 3 Fireplaces -, Jetted Tub and Fireplace in Master Bath -, Main family room has HD Smart TV with cable and CD/DVD Player and Surround Sound Lower level 2nd family room with HD TV -, Gourmet Kitchen with everything -, Sun filled dining area with views of the forest -, High quality linens and bedding provided -, High capacity Washer and Dryer with supplies -, Oversized Three-car Garage. Massages available for extra charge upon request. Beautiful and well equipped home. John was wonderful and we had a thoroughly enjoyable stay at his Black Bear Lodge. Great home, great location, great host! We hope to come back soon. The property was beautiful clean and spacious. This property was great. It has everything you need as far as cooking laundry comfort in general. Everything was clean. Organized and plentiful. The owner is very professional and understanding. Very nice and helpful. Had answers to any questions that I had. Overall great place to make a vacation and feel like you are at home. Beautiful House!! Loved the deck. Very nice house surrounded by beautiful pine trees in a quiet neighborhood. Nicely decorated and convenient with plenty of kitchen utensils. Well appointed and beautiful home in a great location. House was great, pictures don’t do it justice. Has everything you need. Nice quiet neighborhood away from traffic. 10 minutes to Lake Tahoe, 15 minutes to Casinos, 5 minutes to Lake Tahoe Golf Course, Skiing at 3 major resorts, Sledding and all Lake Tahoe has to offer! A rental agreement will be sent via email and a signature required prior to check in. A damage deposit is required. You can choose to place a cc on file with the owners prior to check in or pay a $500 refundable deposit through VRBO using the cc used for the rental. Refunds of deposits are issued within 7 - 14 days of check out.